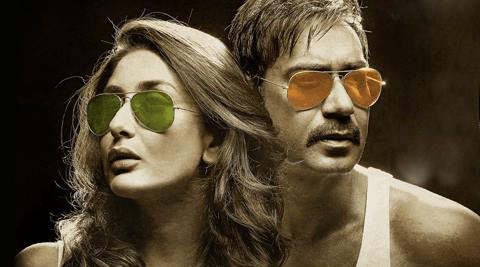 Though he does not roar “Aata majhi satakli” with the same intensity that he did in the 2011 released “Singham”, in “Singham Returns” inspector Bajirao Singham (Ajay Devgn) clearly makes his stance clear that the lion rules the roost. With the righteous police officer now posted in Mumbai, “Singham Returns” pays tribute to the 47,000 policemen of the Mumbai police force and heralds the wake-up call to wipe out corruption in our country. The story is simple, staid and often seen. But what gives it a boost is the treatment. Rohit Shetty takes “Singham Returns” notches above the regular fare that is being dished out as entertainment in Bollywood’s action-comedy genre. The graph of the narration accelerates when constable Mahesh Jadhav is found dead in a sunken ambulance stacked with currency notes. With the media slurring the dead constable’s character, and in the bargain tainting the police force, Bajirao Singham swears to investigate the case. The leads point out to the deviously debauched and corrupt god-man Baba (Amol Gupte) and the scheming head of the alliance party, Prasad Rao (Zakir Hussain), who soon have the virtuous mentor of the Bharatiya Lok Party, Guruji (Anupam Kher), killed. Now with Guruji killed, Singham’s motive to investigate the case becomes stronger, but unfortunately the laws of the land tie his hands. Caught in the crossfire between the Swami-politician nexus and law, Singham dares and is supported not only by his superior, the Commissioner of Police, but also by his entire team. The result is the obvious. Speaking to the Mumbai audience in specific, the film has a universal message of eradicating corruption. It also unravels the frustrations of the law-keepers. And the climax scene, with the policemen revolting, brings back memories of the chaos that Mumbai witnessed in the early 1980s when the policemen went on a strike. The story is timely, treated in a realistic manner and has all the ingredients of a blockbuster in the right proportion. The action is typically Shetty, loud and intense. Humour is infused in the form of witty dialogues with the right punches popping up at the precise moment. So are the songs in the film. They are so evenly paced out that they don’t seem intrusive. The number, “Meri duaa sun le zara” is mellifluous and pleasing. Each character is well defined, with definite arcs. On the performance front, with intensity pouring out of his eyes and flexing muscles, Ajay is once again convincing as Bajirao Singham. With age showing, his romance with Avni (Kareena Kapoor) is neatly tackled and their pairing seems apt. Kareena is vibrant as usual and her inherent flair for comedy is evident in every scene of hers. Amol with his vivid histrionics as the conniving, fraud god-man infuses life into his character Baba. Zakir, though typecast, is effective. But Anupam’s appearance and bearing as Guruji is so akin to the numerous characters he has portrayed earlier, that he fails to leave an impact. The melodrama infused by the supporting cast is praiseworthy. The wide-angle shots, along with the smooth camera movements delivered by Cinematographer Dudley are commendable. Also editor Steven Benard’s sharp and refined razor-cut edits make the viewing a visual treat. Packed with excellent action shots, dramatic sound effects and infectious and exhilarating background score, the film is entertaining, which reinforces the disclaimer shown at the beginning of the narration. And that’s not all. The finale song, “Mala raag ala, raag alaa aata maji satakli,” which rolls during the end credits, will soon be the new anthem of the frontbenchers.